When I was a child and in my early teens I was really quite a tomboy so trainers were about the only footwear I owned (apart from jelly shoes, because who didn't grow up in the 90s and own jelly shoes?!). There then seemed to be a phase when trainers weren't 'cool', which also coincided with my own phase where I actually cared about what was 'cool' and what wasn't so I went through a little trainer lull. For the past few years though, my collection has just grown and grown and I don't seem to be able to stop adding to it because when you wear trainers 99% of the time it's totally justifiable to have approximately 635 pairs right? 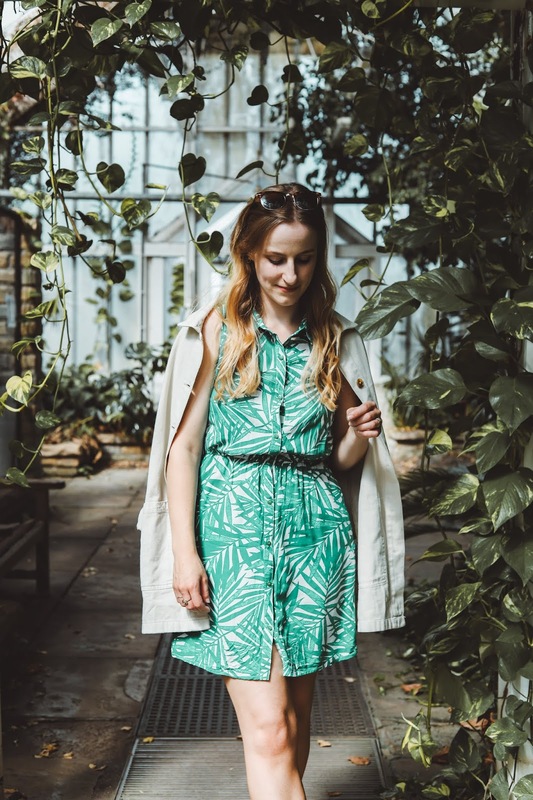 Disclaimer - I don't have that many pairs at all, in fact I probably have less than 10, but there's nothing like a bit of exaggeration to spice up a blog post is there? 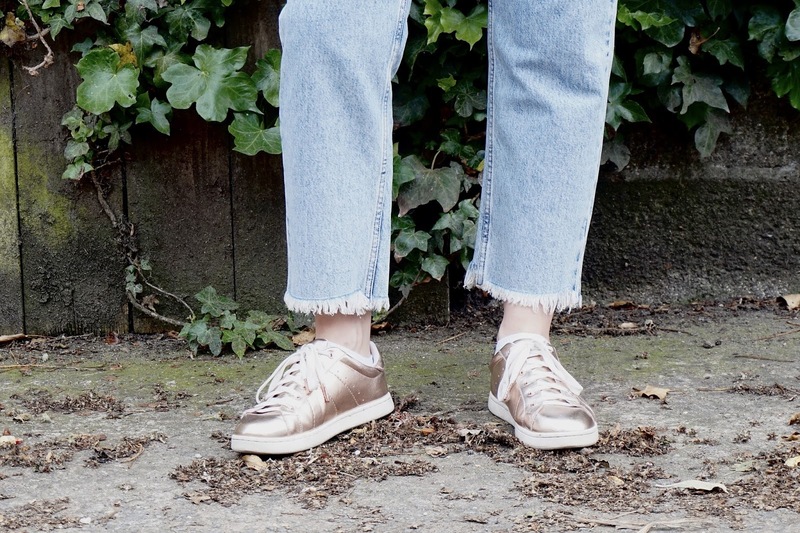 When it came to writing this post I had to really think about which pair of my beloved trainer collection I wanted to style, but in the end it had to be the pair that I've been wearing the most recently and that's these gorgeous rose gold beauties. I bought them back in autumn and have worn them so much. They're so comfortable it almost feels like I'm wearing moon boots and even though I've worn them loads they hardly look like they've been worn at all. They also make the dullest of outfits look amazing because they kinda stand out don't they? I love the colour and although it's bold, it still goes with everything. That's one of my favourite things about trainers too - they go with everything. If you're a regular reader of my blog you might have noticed that I like things that 'go with everything' - basically I'm a lazy dresser and like to not have to think too much about whether pieces go together and just be able to throw things on knowing that they will do. 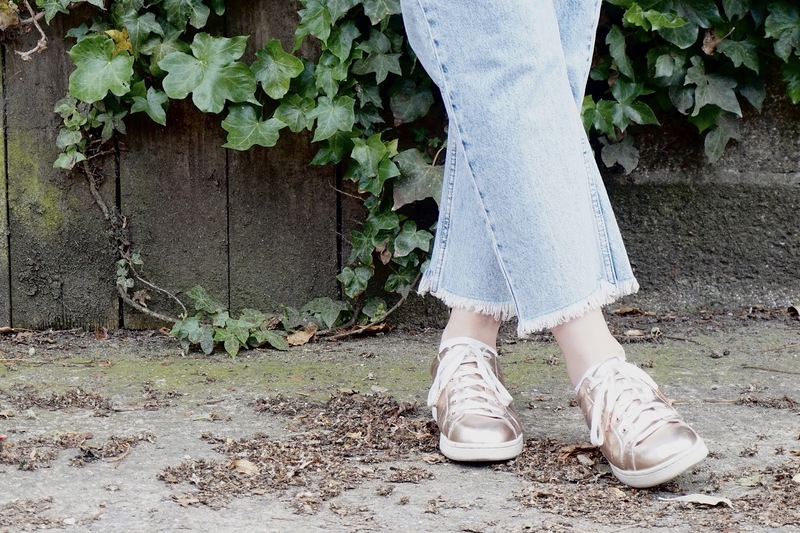 I wear trainers almost everyday at the moment - they're perfect with jeans, culottes, dresses and pretty much anything else I'd wear day to day. I'll talk a tiny bit about the rest of this outfit because it's new and I love it. I've been on the hunt for some jeans with a frayed hem for a while and I actually strayed from Topshop on this occasion, which I usually rely on for all my jean needs, and got these from Monki because I loved the fraying and the cut of them. 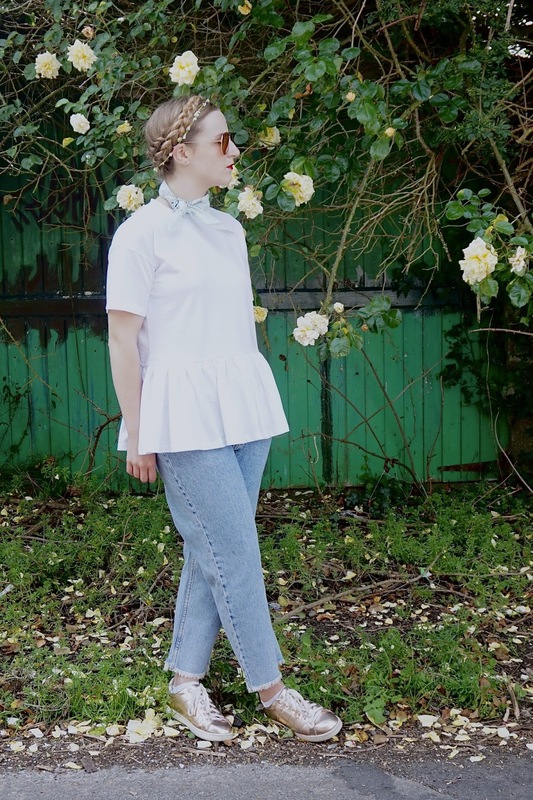 I'd also been wanting a plain white t-shirt, but I spied this one with the peplum detail and snapped it up because I love a basic with a little twist. Also, I'm always up for anything that hides a food baby and this does that perfectly. Are you a trainer fan? Girl, these are beautiful!! 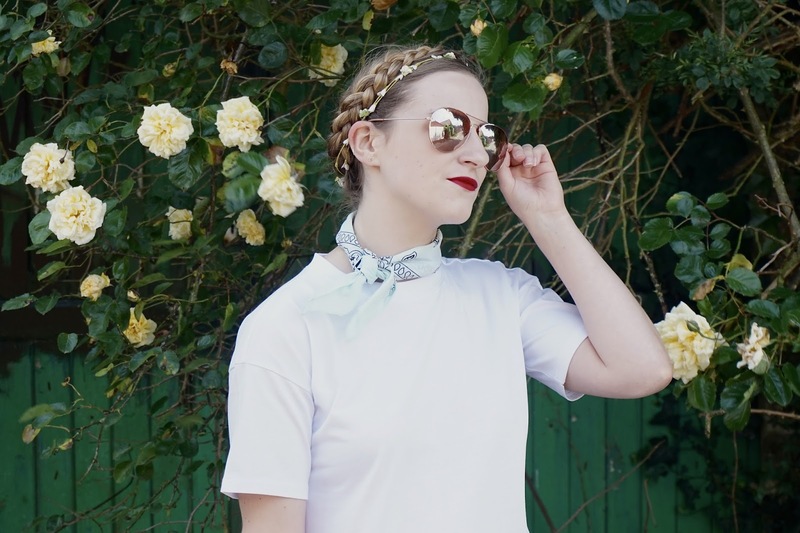 Absolutely love how you've paired them with the sunnies, hair and bold lip. Beaut!! Ahh, when there's so much exploring to do in summer, trainers can be a total blessing in disguise! 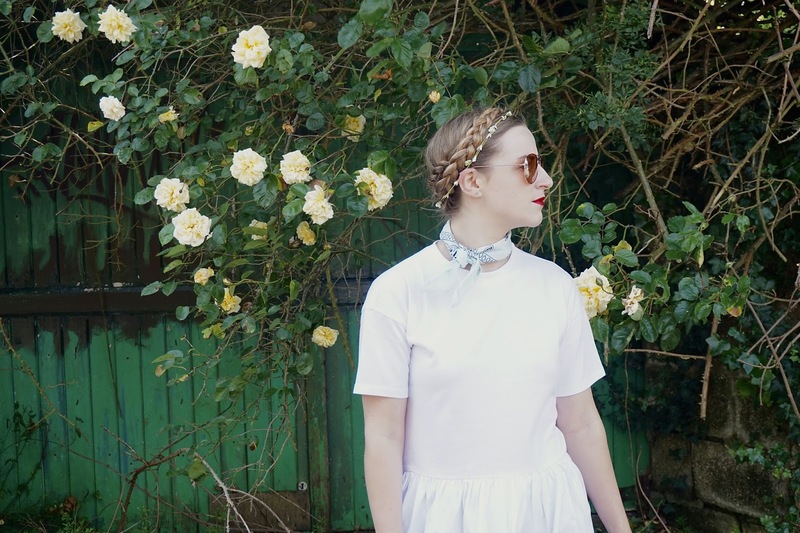 These rose gold beauties are lovely - and I'm adoring your braid by the way!! Absolutely love this outfit Amy, you look incredible! Everything is spot on - the trainers (of course), the top, the sunnies, the hair, the lip - perfect. I love a good pair of trainers too, I need to expand my collection really but for now I'm all about my white carvela ones with rose gold toes. Great post! I absolutely love these trainers and your pretty top. Those shoes are SO perfect for summer. I love the soft beigey pink colour. Super cute hair style too! You must have a lot of trainers if you had to think of which pair you wanted to style haha I was a tomboy as a child too but I had no trainers with shoelaces because I just hated shoelaces for some reason. I would always have to get slip-on or strappy trainers haha I do love these rose gold ones on you though!